In the S.G.C. control room, Dr. Daniel Jackson, Colonel Cameron Mitchell, and Sergeant Walter Harriman listen to a message from Jarrod Kane, an ally from the planet Tegalus (“Icon”). He has gained unauthorized access to his planet’s Stargate. Alone and unarmed, he seeks permission to come to Earth. Kane reveals that Earth has heard nothing from his government for the last five months because of the Ori. As the Rand Protectorate struggled to rebuild last year’s coup d’etat and missile attack from rival nation Caledonia, a Prior came to them with the promise of a satellite weapon that would give them power over their enemy. This weapon is now operational and 24 hours ago, it vaporized a Caledonian outpost. The Caledonians have been given five days to submit to Rand and embrace the Ori … or be exterminated. Mitchell, Jackson, Lt. Colonel Samantha Carter, and Teal’c discuss the situation with Kane, who brought early schematics of the satellite for them to examine. He hopes Earth will use its more advanced technology to destroy the Ori weapon before something horrible happens. Jackson suggests they have a moral imperative to find a solution, since it was SG-1’s travel through the Stargate that originally escalated the Rand-Caledonian war. With General Landry in Washington, D.C., the team decides to attempt to explain the dangers of the Ori to the Rand Protectorate — and use the Prometheus to destroy the satellite, not only to save Kane’s people, but to prevent the spread of Ori technology in the galaxy. Carter discerns from the design schematics that the satellite has no defensive capability, at least not in this early draft of the plans. Meanwhile, Kane tells Jackson of the Ori plague that swept their world five months ago. The Rand people were forced to choose between their faith and their survival, and many — including his wife Leda, who cared for Daniel when he was trapped there — died because of their refusal to embrace the Ori. The Rand Protectorate appears to accept Jackson’s offer for parlay, but upon their arrival, Kane and Jackson are immediately jailed. President Nadal calls Senator Kane a Caledonia spy and Jackson an abettor, so both will stand trial. By the time the Prometheus exits hyperspace within striking distance of the Ori satellite, they have heard nothing from Daniel. An attempt to retrieve him via a locator beacon returns only the beacon. President Nadal orders the satellite powered up. Jackson and Kane are brought to the Rand command bunker. Aware of this shift in the satellite’s status, Prometheus fires — only to find it shielded. The satellite’s energy beam strikes Prometheus and causes considerable damage, cutting right through the ship’s advanced, Asgard-designed shields. The Prometheus‘s one advantage is that the satellite’s energy systems require several minutes to recharge the weapon before it can fire again, giving them time to make another move. Colonel Lionel Pendergast, commander of Prometheus, orders the F-302 fighters, led by Mitchell and Teal’c, into space. As the satellite continues to target Prometheus, the 302s launch missiles, which are ineffective against the device’s energy shield. The weapon fires again, and the Earth ship is devastated. His ship heavily damaged, with no hyperspace capability and even the sublight engines offline, Pendergast radios the planet’s surface and sues for terms of surrender, initially as a way to allow Carter time to restore the sublight engines. When she cannot restore power within the tight time frame, he orders the evacuation of the Prometheus, setting a rendezvous point in Caledonian territory. Nadal ignores the entreaties and orders the Prometheus destroyed. As the crew rushes to escape transport sites the satellite fires a third and final time, cutting the ship in two and destroying it. Pendergast dies manning the evacuation. Back in their cells, Kane and Jackson are visited by Commander Goran Pernaux, an acquaintance of Jarrod’s but also Nadal’s second in command. Jackson tries to explain that the Ori are not gods, but Pernaux himself saw their power with the satellite. Jackson suggests Earth could help Rand build an iris system for their Stargate, or they could bury it, which would prevent further Ori interference. Kane points out that killing the Caledonians in the name of the Ori is not self-defense, but murder. In the Caledonian capital, Mitchell and Teal’c are reunited with Carter and learn of Pendergast’s death. There they meet Caledonian Minister Chaska, who is facing the impending deadline for President Nadal’s ultimatum. After study of more recent satellite schematics, Carter learns that its shields are only active when a threat is detected. She devises a plan to use a Caledonian missile and the inertial dampeners of a 302 to emit an electromagnetic pulse over the Rand Protectorate command bunker, which will knock out satellite control long enough for Mitchell and Teal’c in a 302 to destroy the satellite. President Nadal calls Minister Chaska when they detect the missile launch. She stalls for time by saying it was an accidental firing. He asks her to surrender now, and she refuses. The EM pulse temporarily wipes out power in the Rand command bunker. Jackson and Kane are brought in to explain, but Jackson tells them he has a way out of this moment. Meanwhile, Mitchell and Teal’c are within striking distance of the satellite. Unexpectedly vulnerable to the Earthers, Nadal agrees to listen to Jackson’s suggestion. Jackson proposes giving the Stargate in Rand territory to the Caledonians. Those who do not wish to embrace the Ori can move to another planet, leaving the Ori no reason to target the Rand Protectorate. When the President and Minister agree, Jackson and Carter order Mitchell and Teal’c not to destroy the satellite. Mitchell reluctantly veers off. But once the satellite is safe, the President orders it be fired at the Caledonian capital. He says that they’re Caledonians and they deserve to die for that reason alone. Unwilling to allow his leader to commit genocide, Pernaux shoots Nadal and he, in turn, is shot by Nadal’s guards. Kane manages to defuse the moment after the President dies, and the satellite is shut down. Pernaux declares that the deal remains in effect. Back in Daniel’s office at Stargate Command, Mitchell comes in with beer. He has taken Landry’s letter of condolences to Pendergast’s family. When Mitchell congratulates Jackson on his skillful solution too the Rand-Caledonian crisis, Daniel reveals that both sides reneged on their agreement when the Caledonian people refused to leave their world. The Stargate has apparently been buried in the resulting rubble of a civilization torn apart. In Greek mythology, Ethon was the eagle that gnawed the liver of Prometheus — the name given to Earth’s interstellar battle cruiser on Stargate, of course. In the last year and a half the Rand Protectorate has struggled to rebuild their society following last year’s missile attacks (“Icon”). They are still living in Cold War hostilities with another dominant nation-state on their planet, Caledonia. Intelligence reports indicated that Caledonia was marshaling ground forces to invade Rand and topple what was left of their government. But in recent months an Ori Prior arrived on the planet, promising to give the Rand government the power to strike down their enemies — plans for advanced weapons technology in the form of a powerful, high-orbit satellite weapon. In return, they would adopt the Ori religion and give the powerful ascended beings their worship. The government took the deal, as the Rand Protectorate was on the verge of losing to the Caledonians and collapsing as a nation. This is a somewhat different approach from an Ori Prior than what we have previously seen. In some cases the Ori convince a people that their religion is the true way to enlightenment, and win converts with the promise of ascension — such as Gerak (“The Fourth Horseman, Part 1”). In other cases they preach their message, then strike a people with a deadly plague and promise to cure them upon their conversion (“The Powers That Be”). On Tegalus, they did use the plague — and Kane’s wife, Leda, was one of many who died from it when she refused to embrace Origin. But the Prior also offered the Rand people exactly what they wanted — not only survival and enlightenment, but the real, tangible power to strike down their enemies. It may be a new tactic for them following a recent defeat at the hands of Earth (“The Fourth Horseman, Part 2”). Unlike the Ancients, the Ori are willing to share their advanced knowledge of technology in order to meet their greater goals. The Prior was apparently willing to see Caledonia wiped out rather than converted to Origin because the Rand leaders assured him that, as their sworn enemies, they would never accept anything that Rand had. Following the suppressed coup d’etat and the resulting Caledonian missile attacks last year, Earth offered to help Rand rebuild, but they eventually declined. Earth would not give them advanced weapons technology, which they wanted in order to strike back at their enemy. Earth eventually lost contact with the planet, and feared that the two nations either didn’t want their help any more — or had succeeded in destroying one another. But, in fact, Rand apparently broke off communications with Earth after the Prior of the Ori arrived and offered them the advanced technology that Earth would not. Part of SG-1’s motivation for attempting to destroy the weapon is that the Priors have now started to arm their followers — and there’s nothing to say that they won’t eventually give someone the technology to build ships with which they can attack others, or even aid the Ori in their conquest of this galaxy. Mitchell quotes Jack O’Neill, who once said that every time SG-1 steps through the gate they’re sticking their noses into other people’s business. Jack said this to Daniel when the archaeologist was first petitioning for involvement with Rand’s planet more than a year ago (“Icon”). The Ori satellite weapon is powerful enough to cut through Asgard-designed shields, even when the shields are at full strength — something that should not have surprised the crew of the Prometheus, since Ori technology rivals that of the Ancients, who themselves are far ahead of the Asgard. Marks, the Prometheus helmsman who has been identified as a Lieutenant in previous episodes, has been promoted to Captain. He was among the survivors who successfully beamed off the ship before its destruction. Prometheus has been destroyed. The ship was more than three years old, the first ship built by Earth that was capable of interstellar travel, utilizing a hyperdrive fueled by the rare and artificial element naquadria (“Prometheus”). Commanding officer Colonel Lionel Pendergast went down with the ship, one of several crew members killed. He was the ship’s second and final commanding officer following its official commissioning, after Colonel William Ronson (who appeared in “Memento”). The Ori satellite (as built by the Tegalans with their level of technology) is vulnerable, and was only able to raise its shield because the Prometheus hesitated and did not destroy it immediately after exiting hyperspace — as was originally planned. The ship was destroyed because they did not immediately flee when something went wrong and they couldn’t destroy the satellite — as was originally planned. Daniel tells Jarrod that he doesn’t give up until he’s dead … and sometimes not even then. It’s a reference to his death and ascension (“Meridian”) and return to human form after living a year as an ascended being (“Fallen”). President Nadal, leader of the Rand Protectorate, was not simply a leader looking to save his people from destruction when he accepted the deal offered by the Prior. He was a genocidal maniac who believed even before the Ori arrived on their world that all Caledonians deserved to die. The new weapon made him devoted to Origin and drunk with his new-found power. Nadal would only consider negotiation when his weapon was about to be destroyed and he was powerless to stop it; he then immediately reneged on the deal and ordered his enemy wiped out. When their advanced weapons satellite became vulnerable, Rand rushed to negotiate — offering the planet’s Stargate to Caledonia along with a limited cease-fire. Those who did not want to follow the Ori would be allowed to leave and resettle on another world. But talks between the two nations broke down shortly after SG-1 left the planet. Many of the Caledonians refused the resettlement deal, and launched an attack on Rand. Rand responded in kind. When Earth lost contact, the Daedalus was sent to check in on the planet on its way back from Atlantis, and found the planet in ruins. The two nations have obliterated one another, and the Stargate is presumed buried in the rubble. It is not known whether anyone survived the conflict. With the Rand command center destroyed, the defense satellite would have been inactive when the Daedalus arrived to investigate. As the planet lay in ruins, the ship may well have recovered the satellite and brought it back to Earth for study. The Rand Protectorate leaders recently made the first successful test of their satellite weapon — vaporizing a Caledonian military outpost. Jarrod Kane is now a senator in the Rand government — or rather he was, before the destruction of his nation and his presumed death in the conflict. The satellite weapon’s capacitors take several minutes to charge enough power to fire, then must charge again. It is protected by a defensive energy shield, which is only activated (manually) when a threat it detected due to the high power requirements. 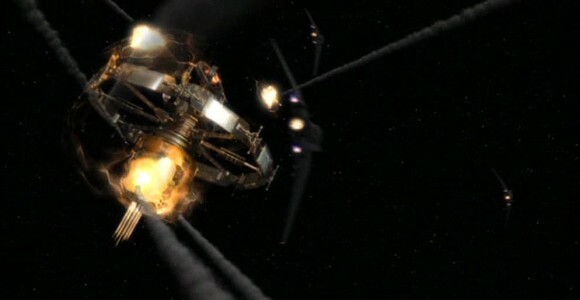 The satellite is controlled by the Rand central command facility on the planet’s surface, so SG-1 was able to render the satellite vulnerable by severing the communications connection. The Prometheus evacuation procedures used the ship’s Asgard transporters to evacuate the ship’s crew to a safe location — in this case, an open field in Caledonia. Presumably, Earth’s other battleships have similar procedures in place. The Prometheus crew compliment was more than 115. Seventy-six evacuees were recovered on the surface of Tegalus, in Caledonian territory, apparently not counting the pilots who were in the F-302s and who landed themselves. As many as 39 crew members were killed in the destruction of the ship. An F-302 fighter craft gives off an EM pulse when it blows up. It is theorized that this phenomenon has something to do with the concussive force of the explosion interfering with the artificial gravity field generated by the ship’s inertial dampeners. This phenomenon was first detected when Prometheus was doing clean-up after the battle with Anubis’s forces over Antarctica (“Lost City, Part 2”). It was one of the things Sam was studying at Area 51 while she was gone from the S.G.C. earlier this year (“Avalon, Part 1”). Daniel Jackson – True to his character, Daniel fought and fought for a peaceful resolution to the decades-old war between the Rand Protectorate and the Caledonian Federation. He joined Jarrod Kane on a diplomatic mission, only to find himself immediately imprisoned as an enemy of the state. Even after the Prometheus had been destroyed and he had feared that his friends were dead, Daniel sued for peace. He convinced President Nadal to listen to reason, and convinced the Caledonians to not destroy the satellite weapon — only to be betrayed by the madman Nadal. Despite his best efforts, the two nations finally went to war and destroyed one another. Lionel Pendergast – After keeping a level head in the heat of battle — a battle his ship lost colossally — Colonel Pendergast bravely attempted to negotiate a surrender with President Nadal of the Rand Protectorate. When it was clear that his ship would be destroyed, Lionel made the hard decision to order the Prometheus abandoned. He managed the evacuation procedures until as many of his crew as possible had escaped — then went down with the ship when it was obliterated. Cameron Mitchell – Cameron hand-delivered the letter of condolence from General Landry to Colonel Pendergast’s wife and children. Were there any survivors from Prometheus who were not recovered with the others, who could still be alive on Tegalus? How did Caledonia have the satellite’s design schematics, even more current than those that Jarrod obtained? Are there any survivors from either Rand or Caledonia? Did anyone from Caledonia move to another world before the fighting broke out? What will become of the powerful satellite presumably still in orbit? Without the Rand command center to activate it, did the Daedalus recover it? VOTE! How would you rate SG-1's "Ethon?"